In situ measurements of austenite grain growth were made at various temperatures in the range of 1273–1473 K with subsequent isothermal holding time of 3600 s for the Nb–Ti-bearing and Nb–Ti-free high carbon steel by using a confocal laser scanning microscope. The solid solute behavior of Nb–Ti carbides during austenitizing process was analyzed. 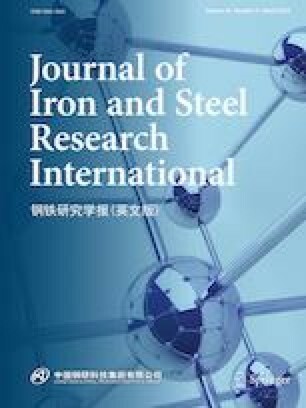 The experimental results indicate that the austenite grains of both steels grow up gradually with increasing the heating temperature and holding time; the size and growth rate of austenite grain of Nb–Ti-bearing high carbon steel are much lower than those of Nb–Ti-free high carbon steel. A large amount of (Nb,Ti)(C,N) nanoparticles are observed in Nb–Ti-bearing steel, which retain the strong pinning effect on austenite grain boundary. The kinetics model of austenite grain growth of Nb–Ti-bearing steel during isothermal heat treatment is obtained and the predicted values calculated by using the model meet the experimental values very well. The authors gratefully appreciate the financial support by the National High-tech R&D Program (863 Program) of China (No. 2015AA03A501).